In the United States and Europe, support columns in most buildings are constructed of either steel 'H-beams' or concrete (with steel reinforcing bars). Some buildings actually have both. DID YOU KNOW that these two types of support columns require two completely different types of explosives to cause their 'failure'? Concrete columns are generally easier to destroy, and usually require a small amount of conventional dynamite packed into specially drilled holes. 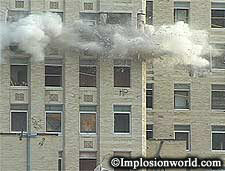 Steel beams, however, require a very high-velocity explosive to perform a 'cutting' action through the steel. 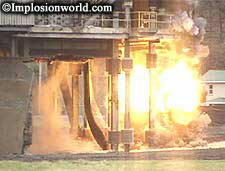 A specialized explosive called RDX, made famous by NASA’s space program, is used to perform this task. This copper-encased explosive is physically attached to the beam, and upon detonation 'slices' at an incredible 27,000 feet per second. A small amount of conventional dynamite is also attached to the beam to 'kick' it out of place so the structure will fall uniformly, in a direction predesignated by the blaster.